I just assumed I would have to give up all of those old casserole, stuffing, dip, and potpie recipes…but not anymore! Thanks to a casserole recipe (pictured) that I found in Eating Well Magazine I was able to extract an easy-to-make “cream of mushroom” binding agent to use in other dishes as well. A blog reader even suggested making extra and freezing the leftovers. Now instead of reaching for a factory made ingredient out of a can how about something similar (but better of course) right out of your freezer? You certainly can’t beat knowing exactly what’s in your food! Heat oil over medium heat. Add leeks (or onion) and cook, stirring occasionally, until just starting to brown, 4 or 5 minutes. Add mushrooms and cook, stirring occasionally, until their liquid has been released and has evaporated, 10 or 12 minutes. Add sherry (or other wine), increase heat to high and cook until most of the liquid has evaporated, about 5 minutes. Sprinkle the vegetables with the flour and stir to coat. Add milk; bring to a simmer and cook for 1 minute while stirring. Stir in Parmesan, sour cream, parsley, salt and pepper. Remove from heat. I hate mushrooms, but I would LOVE a homemade cream of chicken soup recipe. I have several recipes that call for cream of chicken soup that we really like. I can’t promise I won’t ever revert to a can, but it would be great to be able to make it ahead and freeze portions of homemade to have as a substitute. Here is a link to a very good cream of chicken soup recipe. I found the poultry seasoning to be overwhelming, so I just leave it out. It isn’t organic, but you could easy make it to be organic. What do you do for the flour in this recipe? If you substitute wheat flour, is it the same amount? Thanks! This is great! I recently had a whole conversation with a friend about this very issue. 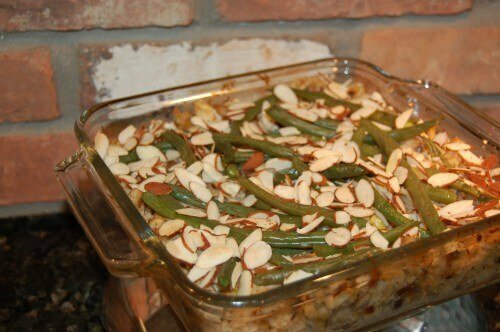 How do you make a real food green bean casserole? I do regular casserole every so often, and always from scratch. I will take a cup of freshly cooked rice (Fresh is always better than leftover for some reason), cooked veggies, leftover cooked meat, and I whip up a little cheese sauce, or a chicken stock veloute. So easy, everyone loves it. Check out foodnetwork.com for a made-from-scratch green bean casserole. Alton Brown has a recipe-includes homemade cream of mushroom soup…and it’s a one dish meal. I love casseroles too…so glad they can still be done (with real food only)! Lisa, do you taste the sherry in the soup? A full cup sounds like a ton, but it would definitely liven up a casserole. You can taste the sherry flavor a little (which we don’t mind)…if you don’t think you would like that part of the recipe I think you could reduce the amount or try a different wine instead. Can I do this without sherry? You could try a substitute, but I wouldn’t leave the wine out all together. I just discovered your blog last week and have nearly read the whole thing! I signed up for the 10-day challenge, but am now committing to a 365 day challenge. That’s right…New Year’s resolution! I feel a little overwhelmed, but I know I can do it. I also live in the Charlotte area, so I will be able to use many of your shopping tips. Thank you! Thanks so much for this. I use Cream of Mushroom all the time! I found your website this summer and my family and I were doing well, but fell off track this winter. We are getting back on. So I am really excited about this recipe. I have chicken in the oven right not with Cream of Mush. from a can…wish I had read this sooner. You can make your own white sauce to replace any can soup in a recipe by simpley makind a reaux out of 2TBS. real butter, melted and mixed with 4Tbs. flour of your choice, I use spelt. Then stir in 2 cups ‘milk’ of your choice, when you have a paste. Whisk smooth and bring to a boil. Turn down and simmer 3-5 minutes until thick as you like. Works everytime. You absolutely are a amazing blogger. Please don’t seize contributing. There are only a handful of blogs left that I love and yours is one of them! Keep up the great blog. We are a big Cream of Mushroom Soup family as well :) Thanks for the recipe. How many servings does this recipe make? I didn’t see that in your post, unless I’m just missing something. Also, can you divide and freeze it? I’m looking for a recipe that makes a lot so that I can stock my freezer. Yes, you could freeze the leftovers. Also, I am sorry I didn’t add the yield to this recipe…I don’t have the exact quantity at this time, but will work to update recipes w/o that info. How many portions did you end up with? And was it the condensed version or the diluted version? Hmmm…I should have measured portions! (next time) And it was not condensed. Have you tried subbing greek yogurt for the sour cream? I’ve heard they’re interchangable but wanted another opinion – thanks! I haven’t personally tried that…sounds like it might work though. What do you do in place of cream of chicken soup? Thank you for the receipe! I’ve tried making this for the freezer before, but it thaws clumpy and separated. Is there a secret to making a cream of mushroom soup equivalent that that you can freeze without altering the texture? I know Carrie (with Deliciously Organic) says to freeze soups and sauces before adding the cream/milk/etc to prevent separation. Then she says to add it after it is thawed. Appreciate the recipe; Campbell’s Cream of Mushroom does seem to be scary stuff. While making from scratch is always best, I have found a version of condensed cream of mushroom soup made by Pacific Natural Foods that you can get a most natural food stores. You can see more about the product at http://www.pacificfoods.com/our-foods/condensed-soups/cream-of-mushroom but the ingredients are: Filtered water, Organic mushrooms, Organic crÃ©me fraÃ®che (organic cultured cream [milk]), Organic rice starch, Organic rice flour, Sea salt, Organic whey powder [milk], Organic onion powder, Organic garlic powder. By the way, Pacific Natural Foods also makes a condensed Cream of Chicken. I have tried just eating it as soup and it is not the same flavor profile as Campbell’s, but I am sure it would sub very well in a casserole or other dish. I am sooo glad to have found this post via FB. I was just writing out my holiday menu last night which included green been casserole and shivered when I wrote down “cans of cream of mushroom soup” on my shopping list! ICK! But, didn’t know where else to turn to find something similar and “real food” approved! YOU JUST SAVED MY THANKSGIVING DINNER!!!! If a recipe calls for 1 can condensed cream of mushroom soup, would you put in 10.5 ounces of this recipe which is not condensed? or about how much of the recipe would you use? I have been cooking a lot if crockpot meals with roast or chicken or pork and many of them call for 1 can of cream of mushroom, no water or broth. If you are going for a condensed version for recipes just keep cooking until the milk thickens (at the end) to the desired consistency. Should work just great as a substitute! I WOULD LIKE TO EMAIL SOME OF THESE RECIPES TO MYB EMAIL RECIPES FOLDER, BUT I DON’T SEE ANYWAY TO DO THAT BECAUSE THERE ISN’T AN ICON, I WOULD APPRECIATE ANY HELP IN THIS SITUATION. THANK-YOU. You would just have to copy and paste to email them to yourself. Thanks for this recipe. I have a gluten sensitivity and my family loves casseroles. We have been struggling to find a whole food cream of mushroom soup to modify some of our favorite dinners. This will be perfect! I’ll just substitute gluten free flour. I never really buy parsley is it possible to leave it out? I’d love to see a recipe like this, only for an onion soup. A lot of the recipes I love to make include cans of French onion soup. I’d like a better alternative. Hi, I am also interested in a french onion & cream of chicken “real” soup recipe. Please share if you know of one. I used it in chicken spaghetti and it was great!! I made this today to stock up on my supply of convenience items for cooking. It’s going in my freezer, and will be used in casseroles in replacement of the nasty Campbell’s soup product! It tastes great on it’s own as well, I just wish my whole family liked mushrooms like I do! Thanks for the recipe! Do you know if you can can this soup using a pressure cooker? I don’t have a lot of freezer room. I like this but I’m not a big fan of all the parmesan. It’s not part of the true Campbell’s flavor. Otherwise great. Parmesan (also chicken, mushrooms, seaweed) is naturally high in glutamates which are the flavor makers. Monosodium glutamate is synthetic glutamate: when you get rid of it you need to substitute a real food with flavor. Thanks for posting! This recipe is delicious! I plan to use it to make a casserole with our leftover Thanksgiving turkey and stuffing. love the alternative to the unhealthy campbell’s version. do you have any suggestions for their condenced cream of chicken soup? thanks! HI there! Do you know how long this will freeze? I’d like to make a lot of it for convenience but wouldn’t want it to get freezer burnt. It’s very easy and you can make cream of chicken and tomato soup too! All from very easy ingredients! And of course just use whole wheat flour instead of white flour. Enjoy! This link was great because it showed you how to make it gluten and dairy free too. Thank you everyone. My family has been loving 100daysofrealfood for several years now and love it! Hi, I was wondering if there was a substitution for the dry sherry? I don’t keep alcohol in the house. I don’t drink and I don’t like to use it for personal reasons. Thanks! I just made this and it is REALLY mushroom-y! :) Did I read the recipe correctly – it’s 1.5 lbs of mushrooms, not 1.5 cups, right? Hello!!!! Can you use this to make a cream of chicken soup?? We are not mushroom eaters, but I have so many recipes that call for cream of chicken. After getting rid of all the processed junk I used a can of cream of chicken and it was disgusting!!! I’ve been looking for something like this. Here’s my question: When a recipe calls for just the can of soup, undiluted with water, will this recipe work? My favorite spaghetti sauce calls for one can of cream of mushroom soup and one can of tomato soup. Thanks for the soup recipes, and Brooke Pillow that was an excellent link you gave for a simple version. I think it’s more like the store bought brands in that they aren’t very flavored, which is why they end up as mixers in so many recipes. Next mushroom sale I think I’ll be making and freezing. Can I use yogurt instead of sour cream in this recipe? Just finished this at it is really phenomenal!!! Can’t wait until dinner time. Curious to see how this tastes reheated in a couple hours (cooking during nap time here) but since I am impatient I am rewarding myself with a mini bowl now. Although it was really easy to make. Nothing harder than chopping onions (my substitute for leeks). Thanks for the recipe. I am going to make another batch soon for freezing! 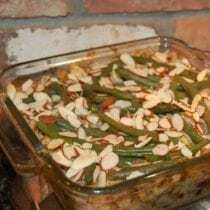 Any chance you can post the recipe for the green bean casserole that you used the cream of mushroom soup in? It looks delicious! The result of this recipe equals how many cans of Campbell’s mushroom soup reconstituted with milk? I just made this recipe today and it turned out amazing!!! I was going to freeze some, but it won’t last that long!!! Thank you!! This mushroom soup looks delicious! However, I am vegan and I was wondering if any of your subscribers have tried making the recipe using vegan substitutes for the sour cream, parm cheese, and milk. If so, did it produce the same consistency? I’m looking to use this for a green bean casserole on Thanksgiving. Any tips would be much appreciated! I used your mushroom soup base from the green bean casserole to make cream of mushroom soup. It was so easy and calls for even less ingredients! We made an excellent cream of mushroom starting with onion, celery, and garlic, butter, salt, pepper. We sauteed and then added organic corn starch. We added the unsweetened almond milk and cooked until thicker. Add the mushrooms. Can also do this with any veggie. We used this recipie tonight with our chicken spaghetti. We used canned diced tomatoes and canned chillis with grated sharp cheddar and fresh boiled chicken. It was amazing. Do you think this could be used for a recipe in a crock pot? I usually don’t put milk in the crock pot for fear that it will burn. If not, I could probably revise the recipe to be made on the stove. Thank you so much! Was wondering if you know where I can find a real food recipe for cream of chicken soup? I have a white bean chili recipe that calls for cream of chicken soup, and I’d like to make it myself. I’ve tried a few on Pinterest but they weren’t very good. Thought you could direct me to a good one. Thanks! Overall very easy! I think a regular onion would perhaps add a little more onion flavor. (Oh i added 2 chopped bulbs of garlic since i like garlic flavor in my gravy! This is great, thank you. Do you have a similar substitution recipe for cream of chicken soup? I was shocked to discover MSG as an ingredient. Thanks! This is so delicious!!! I didn’t have wine on hand so I used homemade chicken stock instead. So yummy! Already looking forward to making it again!! I made the soup from the book. it says condensed so really thick. If I want to eat as a soup, do add water or milk or more broth? Hi Maggie. I would add milk and water to taste. Do you know if this would freeze well to be able to use in future recipes? Hi. Sure, you can freeze this. Is there anything that is non alcoholic that can be substituted? Thanks! Hi Rebecca. I often use apple cider vinegar as a sub for wines in recipes. Thanks Amy! I had never thought to use apple cider vinegar. I’m really excited to try it! Can this be used for most types of cream soups? Cream of Chicken, etc. HI Sarah. While we’ve not tried, I don’t see why it would not be a good base for other cream soups. Love your Recipes!! I too love to cook from scratch. I have a question regarding cream soups. I recently substituted cornstarch for flour in a cream soup recipe to make it gluten free for a friend. It turned out great, exactly the same as with flour. My question is which is healthier wheat flour or cornstarch. I want to make it as healthy as possible. Can you use coconut flour for the wheat flour? Hi. We’ve not tried. But, coconut flour absorbs a lot more liquid so you could not sub it 1:1. Could you use potatoes instead of mushrooms and have a good recipe for Cream of Potato Soup? THANK YOU! Does anyone know if this would freeze well? I would love to make a large batch and store it for later use. Hi there. Any cream soup can separate a bit when frozen but I have found that an immersion blender works great when reheating. Does the amount of soup that this yields, basically work as 1 can of cream soup when subbing into recipes? It yields a bit more. I just wanted to say thank you for this recipe… I’ve made it three out of four weekends this past month. I substitute chicken broth for the sherry and it works great! I am reading your first book, and in it, there is a recipe for condensed cream of mushroom soup. Now, this is kind of a stupid question, but because it is condensed, I am assuming that I would have to add a can of milk, water, or stock to it if I wanted to serve just as soup, and not use it as part of another recipe? The final note is to use it in place of store-bought cream of mushroom soup or freeze. It is more soupy than a typical can of condensed soup. How do you feel about the Pacific organic, gluten free, condensed cream of mushroom and cream of chicken soups? Hi. Other than the addition of rice starch, they keep their ingredients pretty clean: https://www.pacificfoods.com/organic-cream-of-chicken-condensed-soup.